With a stay at Hotel Santika Premiere Malang, you'll be centrally located in Malang, within a 15-minute drive of Alun-Alun Kota and Yayasan Klenteng Eng An Kiong. Featured amenities include a business center, dry cleaning/laundry services, and a 24-hour front desk. A roundtrip airport shuttle is provided for a surcharge (available on request). 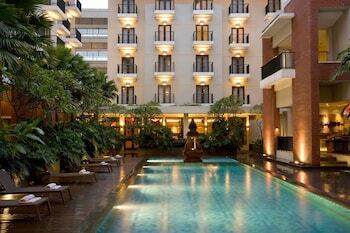 Located in Seminyak, ZEN Premium Seminyak Braban is within a 15-minute drive of Seminyak Square and Legian Beach. With a stay at Coco de Heaven in Tuban (By Pass Ngurah Rai), you'll be within a 15-minute drive of Kuta Beach and Tuban Beach. Free valet parking is available onsite. With a stay at Airy Panakkukang Boulevard Pengayoman 7 Makassar in Makassar (Panakkukang), you'll be 14 minutes by foot from Mall Panakkukang.